My first approach to the Maroma was in 2008. I was member of Otro Circo and Circo Atayde Hnos invited us to a gathering with a group ofmaromeros that were taking part in the newly created Laboratorio de Acrobacia Indígena (an indigenous acrobacy laboratory inCumbre Tajín). Strong relations were built from there between the Zapotec maromeros from Santa Teresa, Veracruz and both Otro Circo and Circo Atayde Hnos. Before the end of the year, we were performing together in their patronal feast. By 2011, I was briefly a member of Transatlancirque, a cross-cultural project directed by Charlotte Pescayre, that combines European-school circus with indigenous Maroma. A circus-kind of spectacle with a strong ritual component, Maroma’s mestizo origin finds its roots in pre-Columbian Mexico. During the patronal feastsof some rural villages,maromeros companies perform their shows. 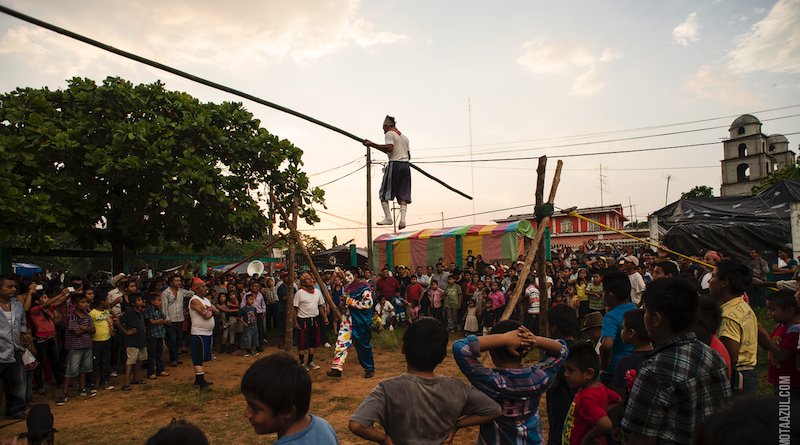 Indigenous and mestizos tight-rope walkers, aerealists and clowns compose these companies, including artists with different grades of professionalization that are usually also farmers. 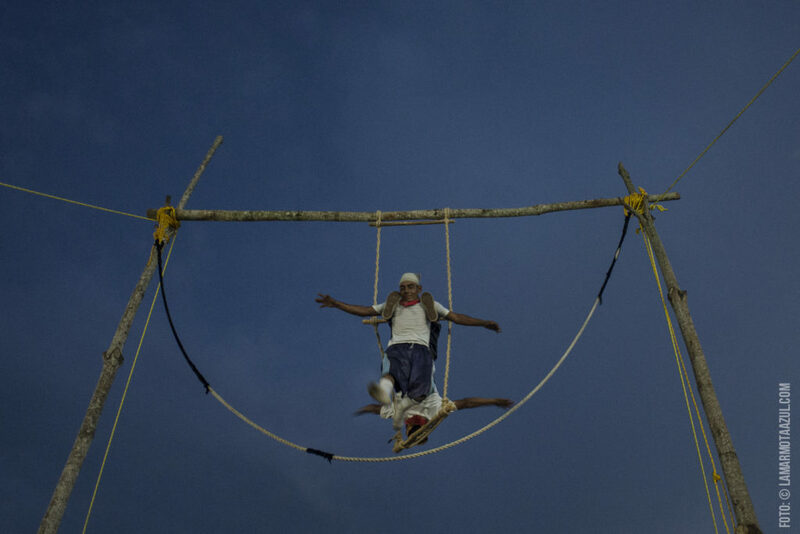 The style and elements of the show vary from one region to another but tight-rope (the maroma) and swinging rope (or trapeze) are characteristic. Maromeros jump on the tight-rope while the brass band plays the typical music for the occasion. Normally there is also a clown reciting verses, bringing laughter both to young and old even if the true sense of the words might be only perceived by the adults. “Great chief, I arrive: I come to laugh. They are some, they are my songs. But not only the clowns in Maroma have remote predecessors. 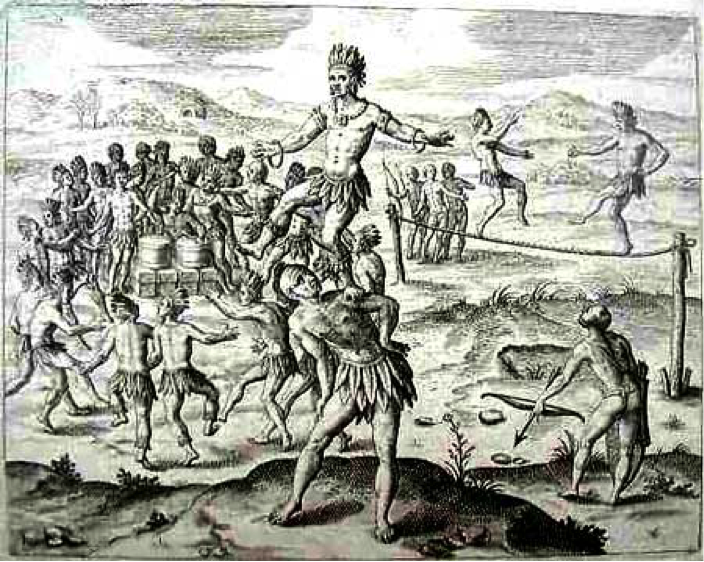 Swinging rope and tight-rope are described in textes and images from the 16th century as native activities of the indigenous population. There are several documents that testify the diversity of the ritual-spectacular-acrobatic practices of the pre-Columbian Mexico. These practices, as everything linked to“pagan”religions were censored by the Christian conquerors. But they re-emerged in different shapes, turned into“innocuous”games and shows, with a new bi-cultural identity: Mestizos. With this first miracle, la Sanjuanita didn’t only become the patron saint of the volatineros (and later the circus people), but she also left a left a trace of the presence of itinerant companies of performers in colonial Mexico from the early 17th century. In La fabulosa historia del circo en México (a monumental book by Dr Revolledo Cárdenas, co-edited in Mexico in 2004 by Conaculta-Escenología A.C.) there are several references of the Maroma companies that toured our territory during viceroyalty times. These companies grew along the colony, taking a clear and prolific shape by the last third of the period. There exists an extended documentation of the activities during that time:maromeros used to perform in public squares, bullrings and especially in the patio de maroma (these patios were the courtyards of neighbourhood buildings known as vecindades). 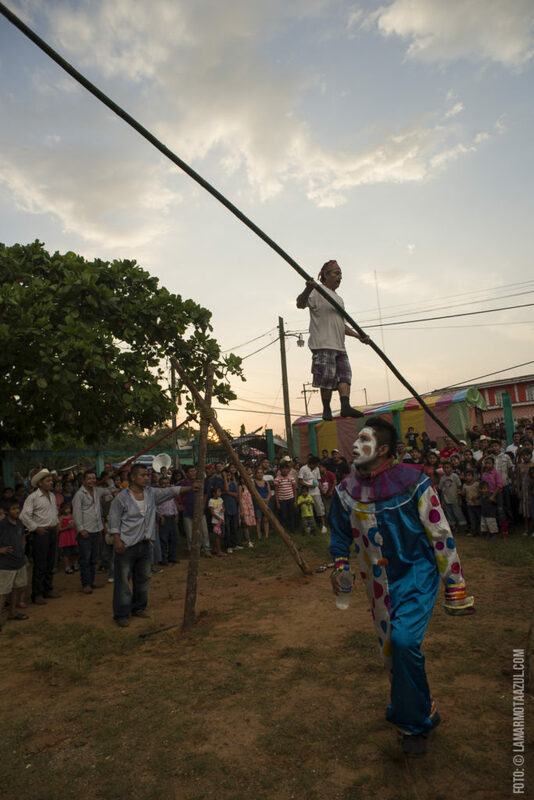 A show in a ‘patio de maroma’ would typically include verse-reciting, the presentation of an exotic or trained animal, clowning, acrobatics and rope-walking (where the name maroma comes from). The arrival of the modern circus to Mexico, by hand of the Englishman Philip Lailson in 1808 with his Real Circo de Equitación, set the beginning of a new era for the show business. Incapable of satisfying the new preferences of urban audiences (whose interest had turned towards the newly arrived European show and its glamorous acts),maromeros were pushed to the suburbs and from there to smaller towns. In 1841, José Soledad Aycardo founded the first Mexican circus, the Circo Olímpico. By the end of the 19th century, circus was all over the country. Some of the circus families that still exist nowadays were born in that time (like Suárez or Atayde). Mexico City had the amazing Circo Teatro Orrin, a circus-building with capacity for over 2000 people (and electric light!). Circus was completely incorporated into Mexican culture. But Maromadidn’t disappear, it remained rooted in peasant and it persisted in certain villages– being taught from one generation to another until today. Today we find maromeros in some regions of Oaxaca, Guerrero, Puebla y Veracruz. Although until a few years ago the groups from different regions remained unrelated, initiatives like Correspondencias Maromerashave been useful to create bridges and to permit interchanges, enriching their work and helping to spread it. Besides Maroma, there are other spectacular acrobatic expressions of ritual and festive origin in our country, like the Zancudos de Zaachila or the famous Voladores de Papantla…But that will be subject for another occasion. For now I invite you to watch the video of the 3rd Correspondencia Maromera. Enjoy! Pescayre defines herserlf as ethnofunambulist, and her anthropological research is essential to understand the phenomenon of Maroma, of which she’s not only the main researcher in Mexico, but she has fueled its development through the creation of Correspondencias Maromeras (national gathering of maromeros). Maroma shows are not exclusive of the patronal feasts, though these celebrations are their most frequent stage. The word maroma comes from arab-hispanic mabruma and it means rope. To walk on the maroma means literally to walk on the rope: funambulism. Like it happened with many other speciatilies, the word maroma was quickly used to refer not only to funambulism but any circus-kind activity. Nowadays, in Mexico we say maroma when we talk about floor acrobacy. Volatineros, titiriteros, maromeros, are actually different specialities, but the names were used indistinctly for any traveling performer. Rodrigo Hernandez is a professional circus performer who specializes in Perch balancing and hand-to-hand. Since 2010 he has worked with Solène Albores as one half of DUO CARDIO. 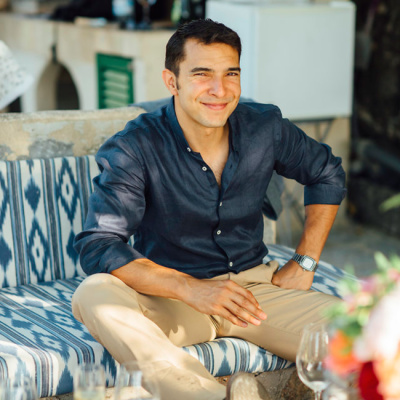 He was born in Mexico City and raised in Montevideo. Rodrigo is a founding fellow of the cultural centre “Circodromo”, in Buenos Aires, and of the Mexican centre of circus documentation (Dokucirco).